Home Blog How Do Sea Turtles Mate? When sea turtles reach maturity and are ready to reproduce, they migrate from their feeding grounds to the beach where they were born. Female turtles swim back every 2-3 years, while male turtles migrate annually. Green sea turtles reach maturity at about 20-25 years of age, depending on a number of factors such as food availability, for example. 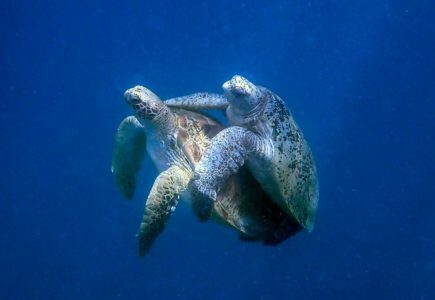 As part of his courtship behaviour, a male turtle will approach a female sea turtle and gently bite her neck and flippers . 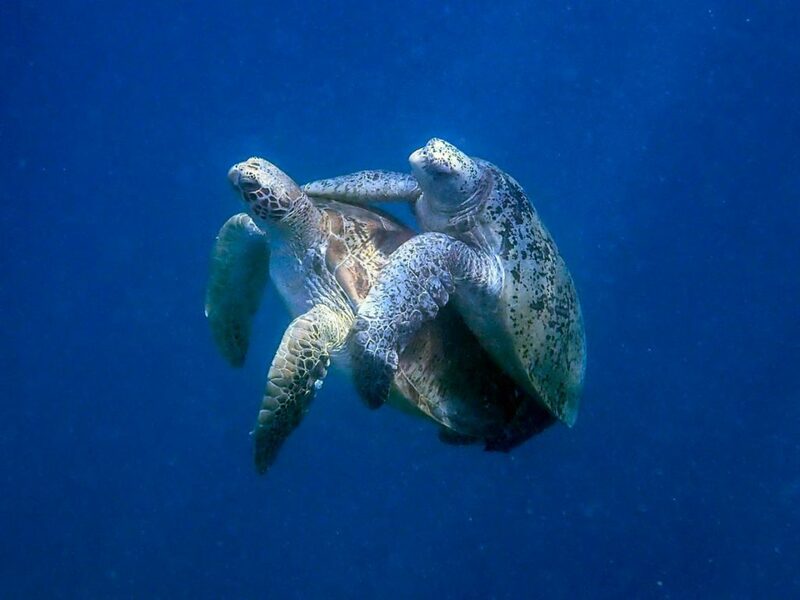 If she does not try to get away, the male climbs onto the female turtle’s back and holds on to her carapace with the long, sharp claws of his front flippers. The way he hooks on to the edge of the female’s shell often results in a scratched shell and bleeding wounds in the soft parts of her body. Copulation can take place on the surface or under water. Mating can take several hours. Afterwards, the male will try to hang on to his partner’s shell to prevent other males from mating with her. Several males may compete for one female at the same time, aggressively biting his tail and flippers to get him to let go of her. Mating is not easy for a female sea turtle. She must support both her own and the male’s weight and regularly swim to the surface for them to breathe. This is even more difficult when several males compete for her and she may be at risk of being drowned. After the male and female separate, they mate again with other sea turtles. A female will mate with several males and store the sperm for several months until she is able to fertilize all of her eggs and start nesting. A female sea turtle can lay several clutches of eggs in one season. The eggs are all fertilized by a variety of males, which contributes to the genetic diversity of the population. The females are very vulnerable when they come on land. They are not well adapted to for life out of water and therefore move very slowly. As she starts laying her eggs, she goes into a trance-like state. Once finished, she covers the egg chamber with sand. On average, an egg chamber can contain anywhere between 70 and 125 eggs. She then crawls back into the ocean and leaves the hatchlings to fend for themselves.